In early polyphony FALSETTO singing played an important part, probably long before the technique was specifically described. Jerome of Moravia’s 13th-century treatise Discantus positio vulgaris mentions three voice registers: vox pectoris, vox guttoris, and vox capitis (chest, throat and head registers). Until the 19th century almost all mention of the vox capitis (later voce di testa) can be taken as referring to falsetto. An awareness of distinct vocal registers in the late medieval period became more pronounced as the range of the several lines of polyphony begin to expand, especially since church music was sung exclusively by male voices. The use of boys’ voices for high parts is mentioned as early as the late 9th century, when the author of the Scolica enchiriadis allowed that in the performance of parallel organum ‘the highest voice can always be supplied by the voices of boys’. Pictorial evidence seems to indicate, however, that throughout the ensuing centuries the top lines of polyphony were most often performed not by boys but by men, singing falsetto where necessary. Hand in hand with the gradually expanding compass of polyphonic music went a growing appreciation of the different timbres and ranges of male voices. In the late 15th century, for example, there was a rapid growth of interest in the bass voice, observable not only in the creation of separate bass lines as a harmonic foundation to counterpoint (the contratenor bassus), but in the emphasis on low voices for their novel sonorous effects. Voice nomenclature puts stress on the Greek prefix bari- (‘low’), producing such inventions as baricanor, baripsaltes, bariclamans, barisonans and baritonans. Composers such as Busnois, Pierre de La Rue and Ockeghem wrote works that feature two parts below the tenor; the Missa Saxsonie of Nicolas Champion (1526) has a bassus part, A-d’, and below it a baritonans part, F-b. Not surprisingly Tinctoris named Ockeghem as the finest bass he had ever heard. This vogue for manneristic emphasis on the newly discovered bass voice was, however, of brief duration, the male voices in late Renaissance sacred polyphony being normally the BASSUS, TENOR, ALTUS (usually a somewhat higher tenor), and CANTUS or DISCANT (generally sung by falsettists until the end of the 16th century). 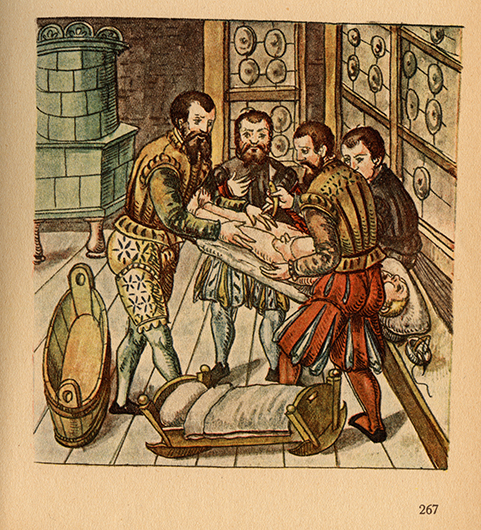 Image showing surgical preparation for testicular castration, from Caspar Stromayr’s Practica copiosa, written in Lindau and completed in 1559, with caption that reads:, “Dise Figur ziagt gar Eben/ Wie die Kinder sein zu legen” (This figure shows exactly how to lay the children down.) The original is extant in Leipzig, Frankfurt am Main, at the Deutsche Nationalbibliothek. Reproduced from Die Handscrift des Schnitt- und Augenarztes Caspar Stromayr in Linden im Bodensee in der Lindauer Handscrift (P.I. 46) vom 4. Juli 1559, edited by Walter von Brunn (Berlin: Idra, 1925), plate 8 (p. 267). Very few singers before the second half of the 16th century seem to have been famous as soloists in their day. The singer who was merely an effective interpreter of other people’s music is virtually never mentioned in early writings, and the earliest singers whose names are known in any numbers were the troubadours and trouvères of the 11th to the 13th centuries, who functioned in a tradition where poet, composer, and singer were usually one. The almost contemporaneous Minnesinger similarly viewed the important singer as the poet and composer of his own songs, and the composer-singer continued to figure importantly in the development of music from the late 14th century to the early 16th in the cultural centres of France, the Low Countries and Italy. Philippe de Vitry was recalled as the ‘flower and gem of singers’ in an anonymous 14th-century treatise once ascribed to Theodoricus de Campo, and Paolo da Firenze was probably only one of many trecento composers who were also singers. Dufay, La Rue, Josquin, Obrecht, Agricola and others, who spent their careers as chaplains at various European courts, served as both composers and singers. As various Italian courts (Naples, Milan, Florence, etc) began to emulate the papal choir in the second half of the 15th century, Flemish singers came into great demand and for the first time singers of one nationality were sought after to perform for audiences in another country. About the middle of the 16th century music treatises began to appear which reveal a new emphasis in the art of singing; they include Ganassi dal Fontego’s Fontegara (1535), Diego Ortiz’s Trattado de glosas (1553) and Adrianus Petit Coclico’s Compendium musices (1552). Singing became increasingly involved with the art of ornamentation, and did so under the influence of instrumental practice, many of these treatises being addressed principally to players of the flute, viola da gamba, etc. It is evident from some of them that those for whom the instruction was designed were no longer exclusively, or even primarily, interested in sacred music. Although ornamentation could be applied to motets and other sacred compositions, singers were exercising this new art chiefly in the performance of secular music, particularly the madrigal. The most significant development in the history of singing during the second half of the 16th century was the emergence of the female voice (especially the soprano) as both an important participant in performance and an influential factor in composition. There is abundant evidence from the Middle Ages onwards of women singers taking part in performances of secular music, but their participation is not reflected in any requirement for such voices in the music of the period. Probably a large number of female singers and instrumentalists in European courts, until well into the 16th century, were of courtesan status, which is probably one reason why it is difficult to trace their presence through financial records and other scholarly documentation. In the early 16th century, however, a number of important women of noble rank became seriously interested in musical accomplishment. A notable example was Isabella d’Este, Marchioness of Mantua (1474-1539), avid patron of the arts in general and music in particular, instrument collector, lutenist, keyboard player and singer. In her generation all secular music (frottolas and early madrigals) used vocal ranges comfortable for male voices, with falsetto parts that never go above d”. Madrigals of the ensuing decades reflect the discovery of the soprano voice. The mid-16th-century Ferrarese composer Nicola Vicentino distinguished between composition a voce mutata (without women’s voices) and a voce piena (with mixed voices), and wrote madrigals that take the soprano voice as high as g”. This development, occurring in various courts of northern Italy as well as in Rome, reached its apex in Ferrara during the reign of Alfonso II d’Este, who brought together an ensemble of virtuosos that featured the famous concerto delle dame, which inclucled Lucrezia Bendidio, Tarquinia Molza and Laura Pevarara (to the last of whom were dedicated an impressive number of madrigals). The voguish new sound of an ensemble of high voices, mostly female, is used, for example, in Monteverdi’s first book of madrigals (1587), where in virtually every piece the bass enters only after eight or more bars rest, the musical gambit being a display of soprano voices. The new style brought with it a strong element of virtuosity involving all singers, basses as well as high voices. (The notable bass in Alfonso II’s brilliant group was the Neapolitan virtuoso, Giulio Cesare Brancaccio.) Improvised ornamentation was often extreme and in bad taste, and therefore subject to criticism. Giovanni de’ Bardi, in his discourse on ancient music and good singing (c1578) addressed to Caccini, complained of singers who ‘so spoil a madrigal with their ill-ordered passages that even the composer himself would not recognize it as his own creation’. A similar complaint was made by Pietro Cerone, in his El melopeo y maestro (1613). Some composers took to writing the virtuoso element into the music itself, as in the case of Giaches de Wert’s eighth, ninth and tenth books of madrigals, composed between 1586 and 1591. The passion for vocal ornamentation found a more suitable outlet in monody. The arch exponent of this new genre was Giulio Caccini (c1554-1618) who in his preface to Le nuove musiche [301k Gif] (1601/2) described an elaborate style of vocal ornamentation which, he explained, was distinct from the practices cultivated in instrumental music. In his Nuove musiche e nuova maniera di scriverle (1614) this remarkable art is notated in explicit detail. The style involved not only elaborate ornamentation but also extensive use of dynamic inflections, exclamations, and portamentos. Most important for the future of vocal music, the monodic style placed great stress on the free rhythmic delivery of the text, ‘as though narrating in music’ (‘quasi favellando in armonia’). This mannerism, the first step towards the invention of the stile recitativo, was for two centuries to serve as an indispensable part of the musical language of the cantata, oratorio and opera. The stile recitativo is history’s most notable instance of a performing practice in the art of singing fundamentally affecting the structure of music and the entire approach to vocal composition. 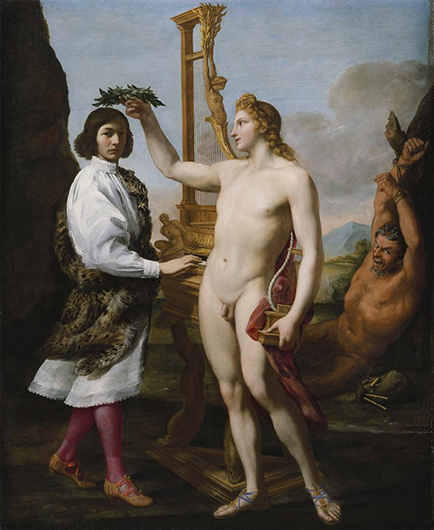 The period from about 1575 to 1625 witnessed two overridingly important developments in the history of singing: the rise of the CASTRATO and the invention of opera. The castrato voice made its first significant appearance in church choirs. The discovery of the female treble voice in secular music had created an exciting new sound which the Counter-Reformation Church could not do without. With women barred from participation in church music, only the castrato could provide the sound required, and so moral qualms regarding castration were set aside. The castrato voice was quickly discovered by opera composers, however, who made better use of its special qualities than did the composers of Catholic church music. Castratos nevertheless survived in the church until as late as the early 20th century. In 1913 the castrato Alessandro Moreschi retired as director at the Sistine Chapel; he made several recordings at the beginning of the century and died in 1922.